Pot stickers are those delicious little fried Chinese appetizers we all love so much but think we could never make at home. The surprise is that potstickers are easier than you might think, and these might even be more delicious than the ones you’ve had in restaurants! In a bowl, combine shrimp, green onions, garlic, egg white, cilantro, ginger, salt, black pepper and cayenne. Place wonton wrappers on a clean work surface. Place a heaping teaspoon (5 mL) of shrimp mixture in the center of each wrapper. Lightly dampen inside edges of wrapper with water and gather up and over filling into a little bundle, squeezing edges together lightly. In a deep, heavy saucepan, heat 3 inches of oil over medium heat until it registers 375ºF (190ºC) on a thermometer. Working in batches, fry pot stickers until they are golden brown, about 3 minutes. Using tongs or a slotted spoon, remove the pot stickers to a plate lined with paper towels to drain. For the dipping sauce, in a small bowl, whisk together mustard, sour cream, soy sauce and hot pepper sauce until smooth. Season to taste with salt and freshly ground black pepper. Serve the pot stickers with the Hot Mustard Dipping Sauce. Serves 6 to 8 and can be multiplied up to 4 times. This recipe for Chinese appetizers comes from one of my favorite cookbooks, The Entertaining Encyclopedia: Essential Tips for Hosting the Perfect Party. It is filled with delicious party recipes, but lots of tips for planning the perfect get-together, from how much food to make to how to get late-stayers to leave after the party is over. This recipe uses ready made wonton wrappers. Refrigerated or frozen wonton wrappers can be found in most well-stocked grocery stores, or if need be, in Asian specialty markets. With a few simple ingredients you can make delicious ginger shrimp hot appetizers and this great spicy dipping sauce. A perfect finger food for get-togethers. 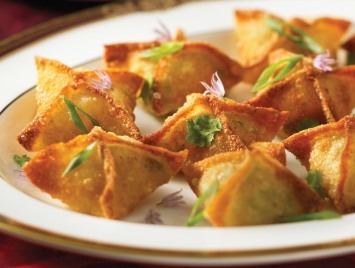 Pot stickers are just one of the amazing recipes in The Entertaining Encyclopedia. You will find our full review of the cookbook here.